Every wondered if you have what it takes to design something, get it made and take it to market? Well that's exactly what Lisa Oakley from vintage Boutique Lotty Blue did when she decided to bring out her own range of vintage inspired aprons.Here's how she did it. Having a fashion design background did help but also having the passion and drive to create my own apron designs was also very important. It was this ambition that was going to be the driving force all through the following six months. 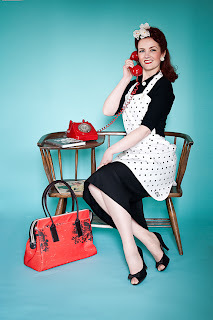 The initial project began with researching the 1940's and the 1950's including what people were wearing, the apron styles and colours , the fashions and also the magazines. 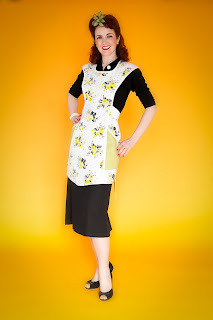 I needed to understand why aprons were so popular so I could start designing my own. It was apparent to me that not only were they a practical item to keep the lady of the house clean but it was also to look nice. 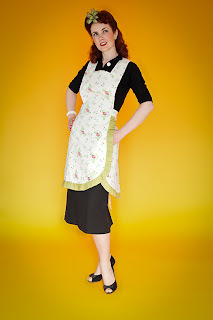 My own Nan had some lovely aprons including half style as well has full length all of which were pretty and feminine. 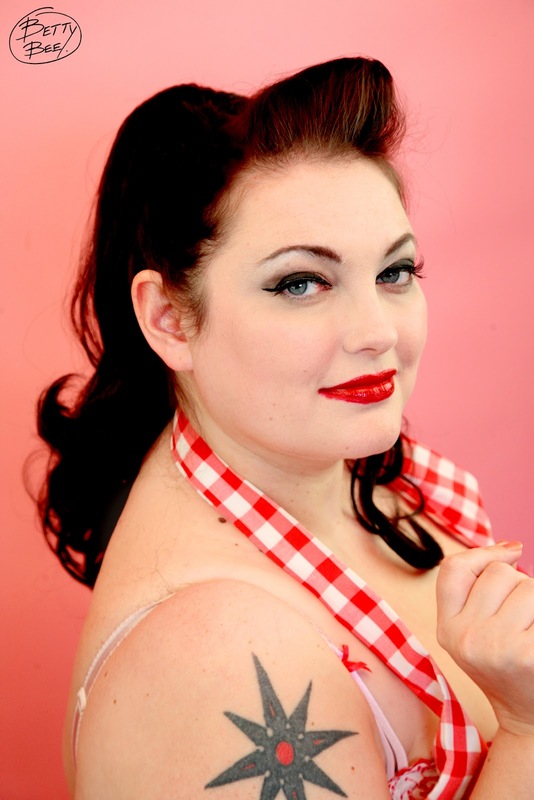 She would never have worn a butcher type apron. My research involved finding magazines of the time and watching clips of all the vintage footage I could find. It was very interesting to see the lady of the house wearing a pretty apron which would cover her even prettier day dress. She would of had her hair done and makeup and would look very attractive. I enjoyed watching I Love Lucy which was an American TV show from the 50's and 60's where Lucy would often be wearing her apron . It was a time where the woman stayed at home and the husband went to work. The lady of the house would be skilled in all things domestic and wearing an apron was considered a very practical way to keep clean and tidy. For many ladies there would be one for day time and then another clean one worn when all the cooking baking and cleaning had been done. During my research I managed to buy a Vogue apron pattern from the late 1950's. I wanted to get first hand knowledge of how the apron looked and by making a few of the styles up I could see how they would of been worn. Many of the styles were very full on the bottom and fitted on the bib at the top. 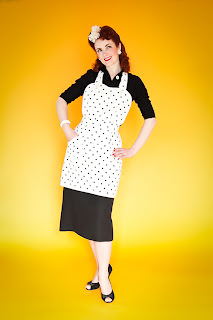 The fashion for wearing a full dress with petticoats underneath would make the 50's dresses stand out so the apron needed to be full enough to go over the dress. The patterns were very detailed with panel pleats binding and could be very complicated to understand the instructions. 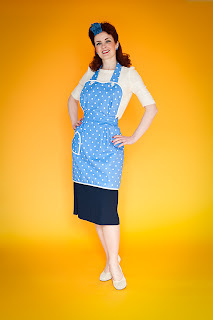 It was a very good exercise and one that would stand me in good stead when it came to designing my own LottyBlue aprons. Everyone has different approaches to design and no two projects have the same requirements. I began with a mood board where I cut out vintage images including period furniture and people. Just about anything that I liked that had the right vintage look. Colours also played a big part so I created an additional colour mood board. I also had a key word sheet where I wrote down words that helped me in the design process words like vintage, nostalgic. feminine, pretty, etc. 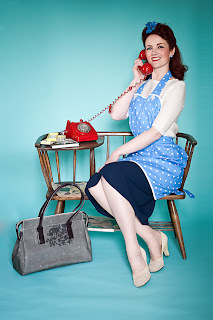 From these mood boards I went on to look at modern aprons which are available today to understand what the modern woman might want. A key element was understanding that fashion has changed, for example we no longer wear dresses with full petticoats. 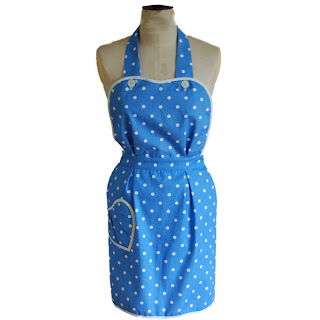 Our clothes are far more simpler and the aprons of today do not need to be as full.There is also the need to make the aprons for a new generation of apron wearers, ladies who want an apron to bake in and to host dinner parties etc. The first designs where no more than simple sketches and outlines. I find getting the images onto paper really helps me. This part of the project was to involve a designer who I collaborated with. The initial process for this took four weeks where we worked very closely on the apron identities, their personalities, names and image . Each of the three designs were to have names so I could give them real personalities. I found this method very rewarding and once the names were chosen the design process seemed to be a lot easier. The aprons were to be called Lola, May and Lottie. The decision was to create a contemporary design with a 1940's/50's feel to them. Once the designs were in place then the next step was to complete the technical drawing. These would be a working reference so the pattern cutter could construct the patterns images. The designer who had helped on the initial designs also assisted with the technical aspect and created a paper pattern for the technical drawings. The technical drawings are very important and getting them right is key for the pattern cutter to then interpret your design. I was very lucky to find a local pattern cutter in Staffordshire who did a fantastic job of the patterns. I had a friend who recommended a local manufacturer in Wolverhampton. My first meeting with them went very well. 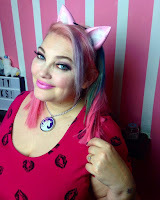 I was well prepared and took all patterns and technical drawings and with my knowledge of industry from my fashion degree course I was able to understand what was going to be involved. I was thrilled when they accepted my proposal and agreed to do some sample garments from the patterns. 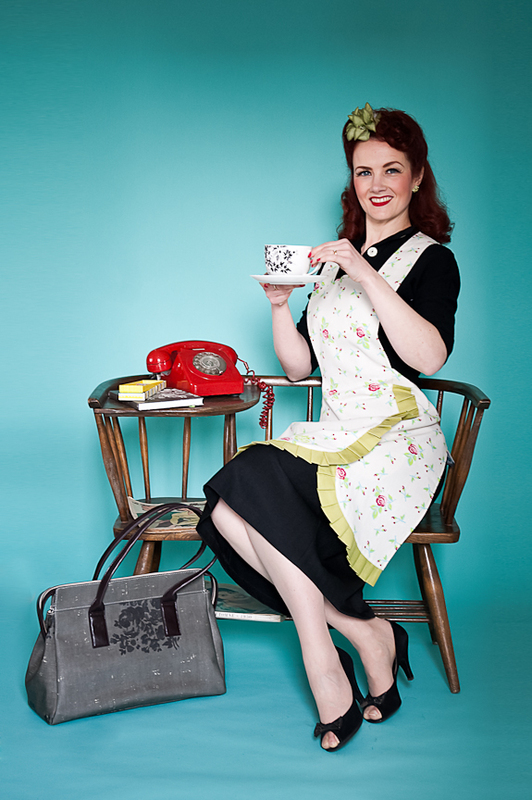 Who will make my amazing Aprons? 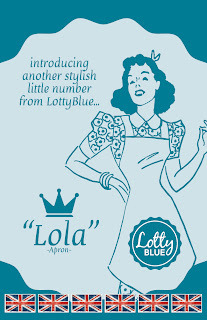 Finally the aprons were in production, the fabrics and buttons were all individually sourced and delivered to the factory and I was very proud to collect the very first LottyBlue aprons after a six month journey. Although it had its ups and downs overall it has been a wonderful experience and one that my dear Nan would of been very proud of. Swing tags - everything has a label and it’s an important part of labeling and selling. We make eye contact with a tag it's where we find information about that item. The design of the tags was done by DK Designs from Stoke on Trent. I had one initial meeting where I submitted my sketches and ideas. I feel it was very important to communicate well and to document so there is no misunderstanding. Keeping everything under control is key if you are project managing it yourself. Care was given to wash care label information of the fabric being 100% cotton wash at 30% etc. The name of the apron was also added to the care label. I have brought these aprons to life from the initial sketches right through each design and production step. The decision to add a personal touch was made by including some embroidery on to each apron. The LottyBlue logo was applied by machine and the threads chosen personally by me. I wanted the aprons to be individual and unique and the embroidery certainty gives them a little bit of special. 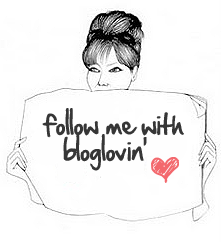 What I have learnt ? I have learnt so much during the design and manufacture process from finding pattern cutters, designers, manufacturers, button suppliers, fabric suppliers and the list goes on. All of which were important and without each of them I would not have been able to complete this project. I have had to be very persistent and determined and learnt to keep to budgets and also to get them completed in a sensible time frame. 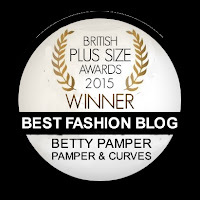 I have now got the knowledge and skills to develop the LottyBlue brand further. My dear Nan would be so proud. She loved making and doing and these aprons are in her memory. I am very proud of my heritage and what makes us who we are .I love the fact that my nostalgic memories of my Nan wearing her apron has spurned me to be creative and fly the flag for Great Britain.These aprons have been designed and manufactured in the UK and all materials have been purchased from UK companies. We should be proud of are creativeness and skills.